An increasing number of studies are showing how our food choices correlate with our mood. They show that it is important to look at our overall pattern of choices as well as a few particular foods. One recent study showed that people who ate a healthy diet were up to 30% less likely to develop depression. 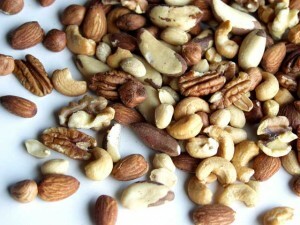 By a healthy diet, they mean one high in fruits, vegetables, whole grains, nuts, fish and unsaturated fats. Another study analyzing a similar diet showed a 30% reduction in the risk of anxiety disorder. This study also included in their healthy diet high-quality meats such as those from free ranging and grass fed animals. Previous studies have also found that diets rich in high-fat dairy, fried foods, and refined and sugary foods are correlated with a significantly increased risk of depression. Our choice of fats can also have a major impact on our mood. In particular, the unsaturated oils have been shown to decrease the risk of depression over time. These include the polyunsaturated fats from nuts, seeds, and fish and the monounsaturated fats found in olive oil, avocados, and some nuts. Some of the best documented brain-supporting fats are the Omega-3 fatty acids from fish. These healthy oils not only decrease the risk of depression, but also support our memory and cognitive functioning. Deficiencies in Omega-3 oils may also be one of the risk factors for suicide. The worst fats for our brains and mood are the trans-fats, which are associated with increased depression and stroke risk. Trans-fats are the artificially created fats that are more similar to saturated fats and are found in many highly processed foods. As far as saturated fats are concerned, I draw a line between those from conventionally raised animals and free ranging animals. Beef from cattle that are grass fed and finished has a fat profile that is more similar to fish and can be a healthy part of the diet for many people. This entry was posted in Health and tagged anxiety, depression, DHA, EPA, fish oil, monounsaturated fats, nutrition, omega-3 fatty acids, trans fats, unsaturated fats, vegetables. Bookmark the permalink.